The conditions inside a typical crawl space make it ideal for fungus growth, especially if your foundation hasn’t been properly waterproofed and you don’t regularly check your crawl space. As mold spreads, it can cause serious consequences for your family’s heath – not to mention problems for the structure and stability of your home. Vented crawlspaces are very common here in Kansas City, because building standards once required them. And while they may seem like a simple solution to prevent moisture buildup, they actually do just the opposite. In older homes, most crawl space vents are designed to stay open and circulate air, not dehumidify or eliminate water. During the summer, hot, humid air circulates through the cooler indoor spaces, coating surfaces with condensation along the way. Precipitation also causes problems when vents are left open. If left unchecked, all this moisture will create mold and mildew. Outdated plumbing can also be problematic for crawl spaces, especially those that are underground. Standing pools of water invite insects to breed and any flooding will damage to your belongings and support structures. If your plumbing system doesn’t have an effective drainage system, your pipes may leak or burst to relieve the water pressure. In a large crawl space, make sure there is a recessed drain on the floor that’s capable of draining large amounts of water quickly. It might also be a good idea to have your plumbing thoroughly inspected by a professional who can repair or replace any sections of pipe that are weak or damaged – especially if you have an older home. One of the most popular forms of insulation now comes in a high-pressure can. This expanding yellow foam quickly fills tight spaces, so it’s a popular choice for wall cavities, roofs, attics, and of course, crawl spaces. It’s also one of the most energy-efficient types of insulation, because it’s so effective at blocking heat, air, and water. However, the very same properties that make spray foam insulation so effective could actually cause problems in your crawl space. If you have wood walls or beams, moisture may get trapped between your foam and the wood, causing these support structures to start rotting. And if your insulation is open cell foam rather than closed cell, it will absorb water vapor rather than trapping it. 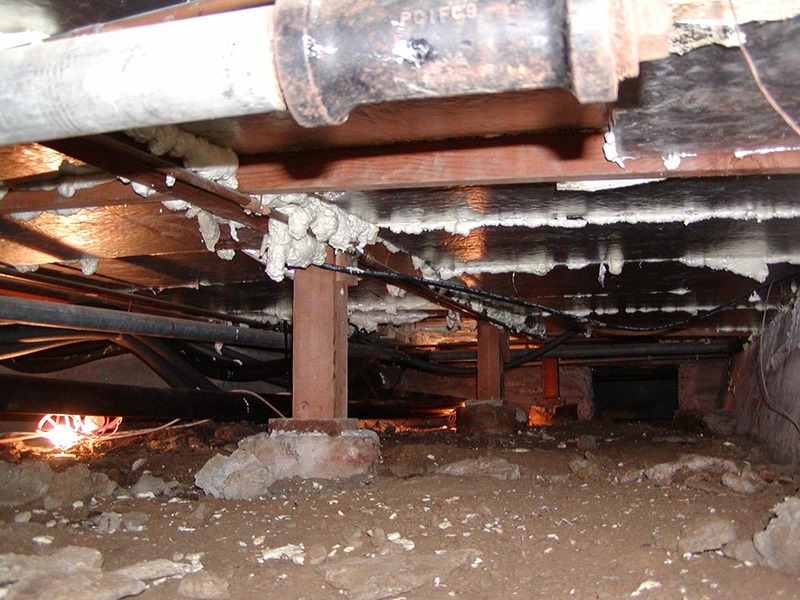 Fiberglass is a terrible choice to insulate your crawl space! Fiberglass isn’t a protective barrier against moisture, and if water does collect on it, the insulation will soak it up like a sponge. Unless you inspect your insulation frequently or schedule regular energy audits, you may not realize it’s a problem until it’s too late. This insulation is designed for use in well-ventilated spaces with exhaust systems that send water vapor outdoors – NOT dark, damp crawl spaces. Fortunately, all of these risks are easily avoidable with a crawl space encapsulation system. We can seal your crawl space to keep out any moisture, prevent structural damage, energy loss, odors, and more! Even better, you’ll finally be able to use the fresh, clean space for storage without risking any water or mold damage to your possessions.